The future of search is visual, whether it’s on Amazon, Pinterest, or Google. Learn what this shift means for SEO and how to adapt. I want to tell you a story about a young Google algorithm. He was born blind, in a world where a picture is worth a thousand searches. This little algorithm had one dream. To be able to see. So he got his friends to describe him images, but still he couldn’t see. He built magical Google Goggles, but these didn’t work. Then one day, he built a learning machine and finally, after years of struggle, he could recognize images. That little algorithm who could is named visual search and has taken on a job as the world’s personal shopper. Look at the two options below, which is more useful if you wanted to buy a handbag? Slyce asked that question to consumers. 74 percent of them replied that text-based keyword searches are inefficient in helping to find the right product online. A 2017 report by Jumpshot & Moz further supports that discovery through pictures is alive and well, with around 27 percent of all searches being for images. MozCast reports image blocks in around 11 percent of Google results. 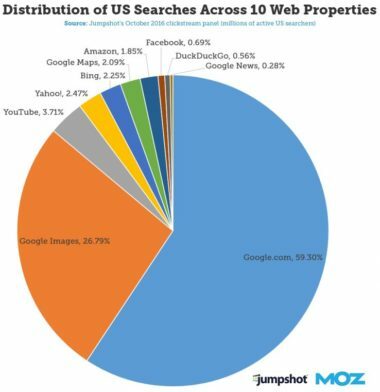 While Jumpshots’ data shows images earn 3 percent of all Google search clicks. Let’s be honest, image optimization is the dinosaur of the SEO world. Sure you sayyou implement image SEO for additional ranking opportunities in Google image search, but in most cases, you don’t truly believe this will have a significant impact on your KPIs. When is the last time you looked at the sessions from image search in Google Analytics? Did you even notice years ago the change from the referral path /imgres under google.com referral to a fully fledged source medium as images.google.com? And one can argue descriptive image file names, alt text, and image titles are used as an opportunity to add a keyword in order to rank the page, not necessarily the image itself. Not to say the image optimization tips above are not valuable. You should still do these things. The hard truth is SEO professionals often neglect image optimization as an afterthought to page-level optimization, if it’s considered at all. And this level of image optimization alone is not going to be enough to win users. In the past there was image search, where search engines took a text-based query and tried to find the best visual match. In the present there is visual search, where search engines, social networks, ecommerce powerhouses, startups and many companies in between take an image as the query. When you see something you’re interested in, whether it’s online or offline, you want a fast an easy way to get more information. For example, you see a pair of shoes in a magazine. With image recognition, you can take a photo and find similar item for sale online. This see-snap-buy behavior is becoming commonplace and has opened up opportunities for companies to enter the purchase cycle with the photo as the search query. This places them higher in the conversion funnel than a text-based search query. Visual search is fast becoming a staple of shopping apps. And with the impact on KPIs, it’s no surprise why. BloomReach found that visual search is associated with 48 percent more product views. Consumers are 57 percent more likely to make a return visits and spend on average 9 percent more on mobile than those who do not use it. Amazon, Pinterest, and many more have launched visual search capabilities on mobile. There is a battle of the brands to be your snap and shop app of choice. At present, early adopters Amazon (turning the world into a hyperlink) and Pinterest (promoting on online discovery) are leading the pack. But Google isn’t taking this lying down. Google has been quietly adding machine learning and image recognition capabilities to mobile image search over the last years. Plotting the updates, you can see clear stepping stone technologies building on the theme of visual search. Related images (April 2013): Click on a result to view visually similar images. 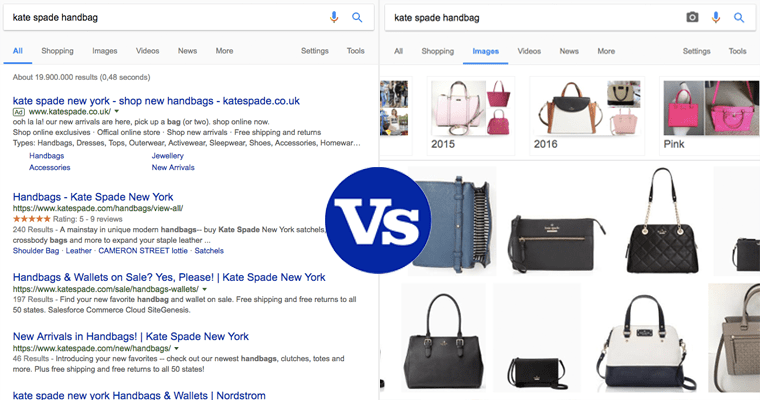 Similar items (10th April 2017): Google can identify products, even within lifestyle images, and showcases similar items you can buy online. Style ideas (April 17, 2017): The flip side to similar items. When browsing fashion product images on mobile, Google shows you outfit montages and inspirational lifestyle photos to highlight how the product can be worn in real life. Image badges (August 1, 2017): Label on the image indicate what other details are available, encouraging more users to click. For example, badges such as “recipe” or a timestamp for pages featuring videos. But the most significant badge is “product” – shown if the item is available for purchase online. These developments highlight that Google is making a play to turn image search into shoppable product discovery. It’s easier to show than tell. For the recipe badge, use recipe markup. For the video badge, use video markup. For the product badge, use product markup. But the more quality detail, the better, as it will make your results more robust. 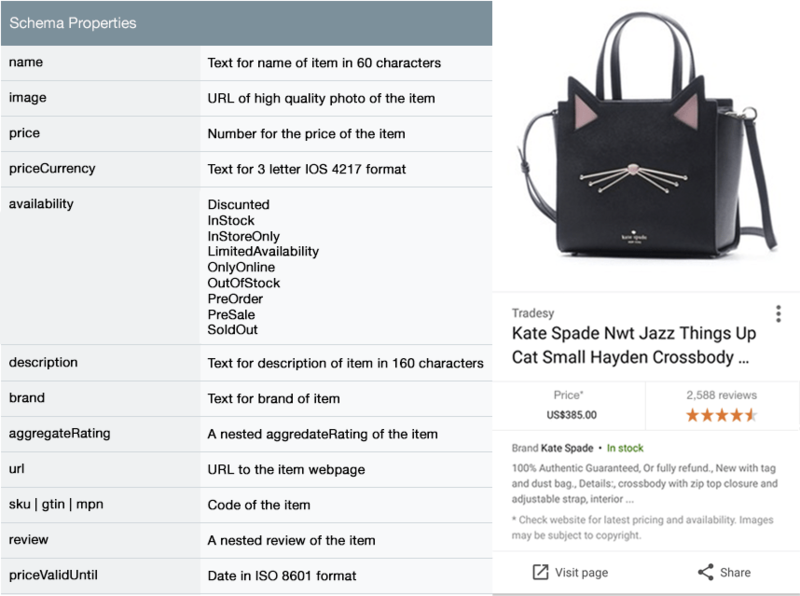 How product markup elements are populated into Google image search is shown below. Run a few URLs through Google’s Structured Data Testing Tool. Don’t simply scan if there are no errors and move on. Be sure to look at the information itself to ensure it’s user-friendly. It can take up to one week for your site’s images to be crawled. Like all schema markup, how items display in search results is at Google’s discretion and not guaranteed. However, quality markup will “increase the chance” of your images showing up. Why your own site? To confirm your images have been indexed. Be sure to do this image search on mobile web or in the Android Search app. It is a mobile-first world. Not all image search functionality is visible on desktop. If you see no image results badges, you likely have an implementation issue. Go back to step two. If you see badges, click a couple to ensure they show your ideal markup in the details. Once you confirm all is well, then you can begin to search for your targeted keywords to see how you rank and if you are eligible for Similar Items or Related Items. Note: While Badges and Related Items are common, Similar Items only cover a limited number of products in fashion. Google says it will expand in the coming months. The future is “Lens” – using your smartphone to translate real world input to digital action. No more QR codes or snap tags. Markerless image recognition is coming. A world where nothing needs to be done to an image or object to turn it into a visual trigger to cue digital content. The static world becomes digitally connected simply by pointing your phone at it. Product packaging coming to life. You point your phone at the product and it displays recipe possibilities, maps to nearby stores with the item in stock or coupon for an online order. Billboards of celebrities endorsing products will naturally connect you to the store to buy the product, but may also provide the latest gossip on that celebrity. Stranger’s outfits become walking ads when I can snap a pic and literally buy the shirt off their back. This will be a world where you can spontaneously buy most items you can see. That is the power of visual search. So, what are you doing to make your brand more visually appealing?